This is a collection of information, thoughts and opinions on certain countries which traditionally performs well at Miss Universe but is nowhere in the limelight or seldom appears in the limelight within the last 2 decades. Finland is one of the most traditionally performing countries in Miss Universe. 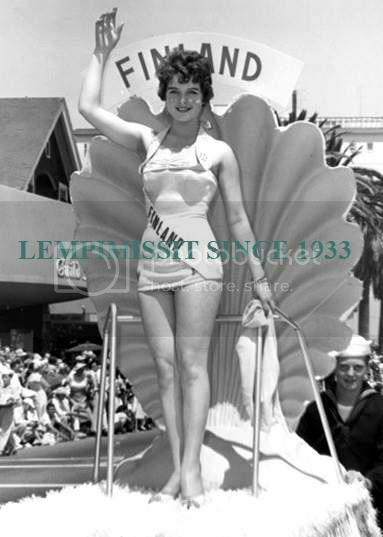 We are all aware that a Finnish woman named Armi Helena Kuusela Kovo won the very first edition of Miss Universe in 1952 in Long Beach, California at the age of 17. 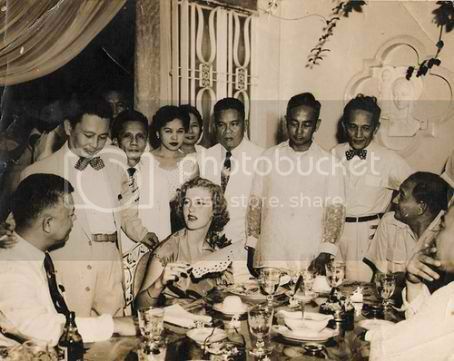 Armi won Miss Universe June 29, 1952 barely 3 months before she turned 18. Armi was born on August 20, 1934 at Muhos, Finland. 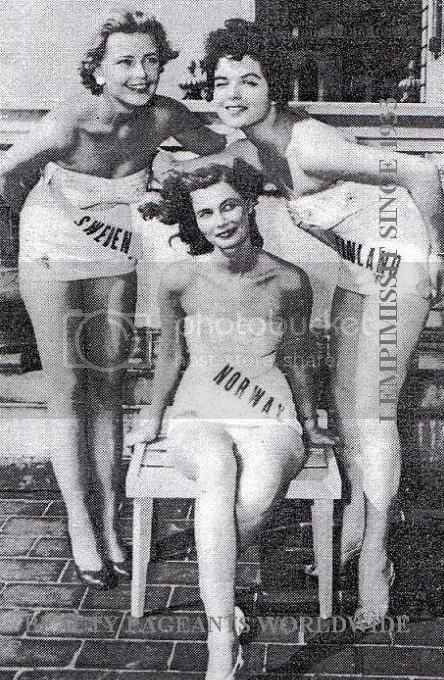 Armi smiling for the press as the very first Miss Universe. 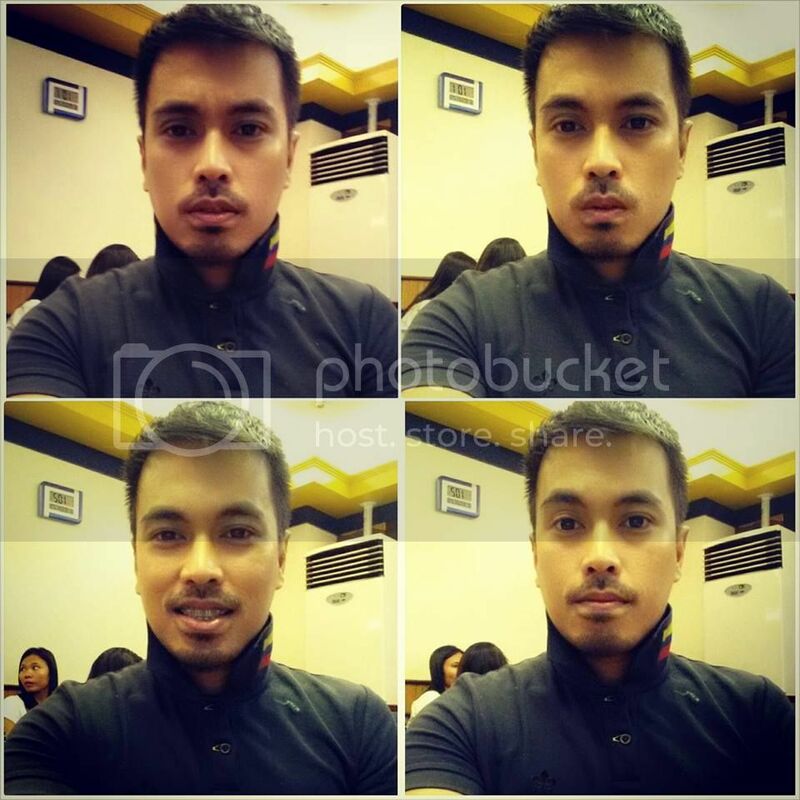 Armi in one of her rarest photos in Manila. 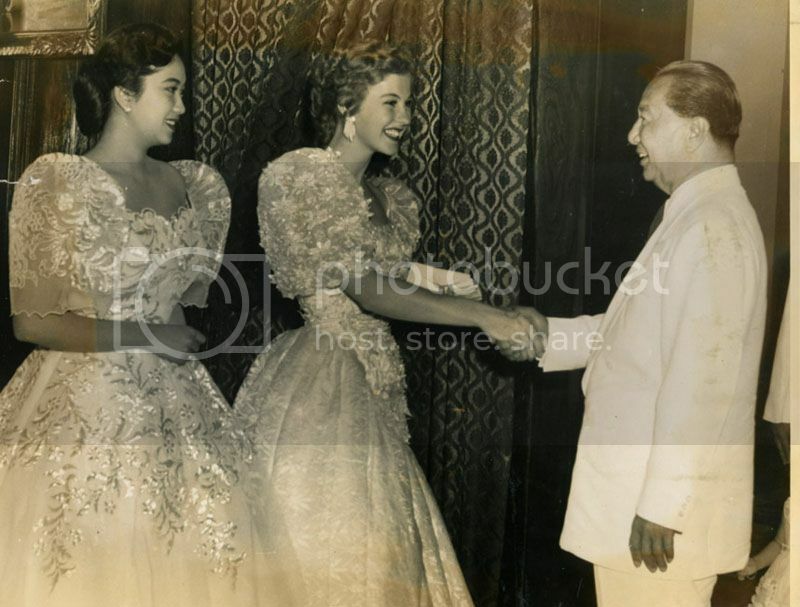 Armi Kuusela met with then Philippine President Elpidio Quirino and Miss Philippines 1951 Teresita Villareal. The 50s was a great start for Finland, only to stop there. Finland did not place in the 50s other than Armi Kuusela. And they did not send delegates from 1956 to 1959. 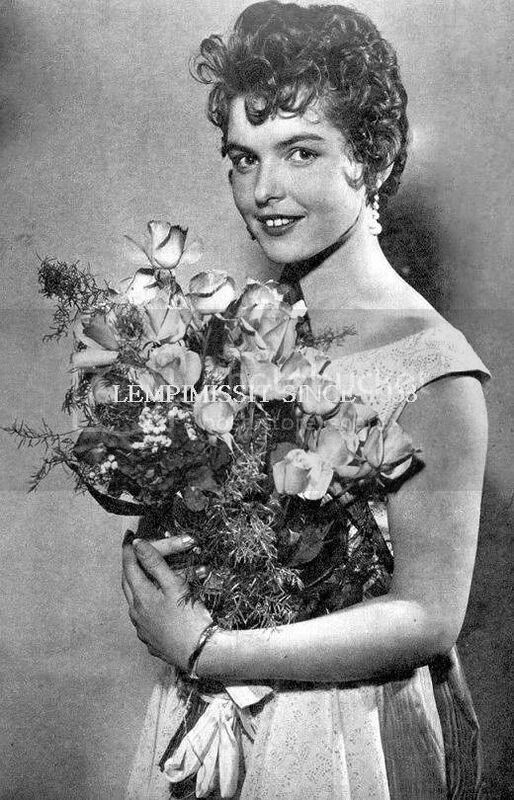 The following year Teija Anneli Sopanen, a subdued beauty, won Suomen Neito 1953 and was sent to MU1953, only to fail to advance to the semifinals from a pool of 24 contestants. 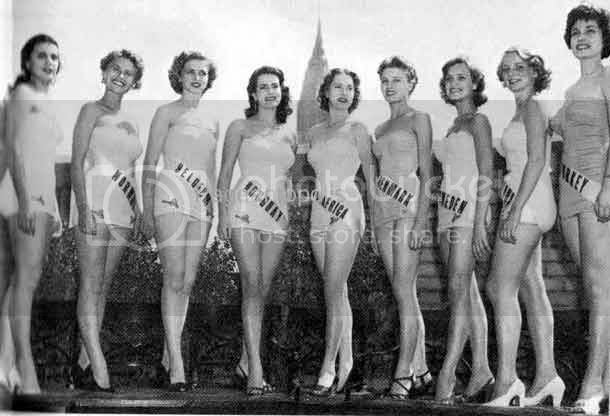 Teila, 2nd from right, poses before the photographers in Long Beach for MU1953. 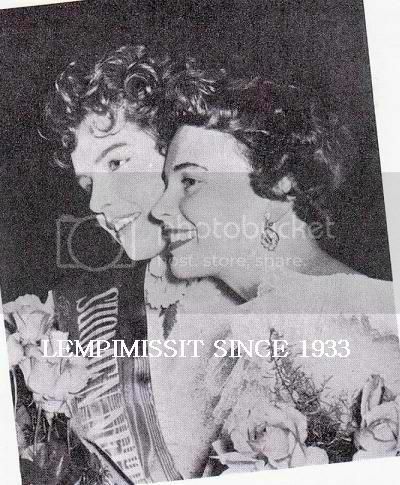 The last Finnish delegate to Miss Universe in the 50s is the stunning Sirrku Talja in 1955 who, surprisingly, was not called among the Top 15 semifinalists among the 33 delegates that year. Neighboring Miss Sweden, Hillevi Rombin, won the coveted title. Sirrku winning Suomen Neito 1955 earning her the right to represent Finland at MU1955. Sirkku during the MU1955 Parade. The 60s marks the come back of Finland at Miss Universe. It send the stunning brunette 20-year old, 168cm tall, Marja Leena Manninen. But Marja was not the winner of Suomen Neito 1960. She was only the 2nd Runner Up. Suomen Neito 1960 winner Tarja Nurmi did not want to go to Miss Universe and the 1st Runner Up Heli Heiskala also did not want to travel to Long Beach. It would take a decade since 1952 that Finland have to wait for another Finnish woman to enter the Miss Universe semifinals. 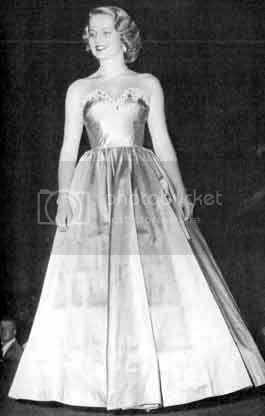 In 1962, the stunning 173cm brunette Anja Aulikki Jarvinen finished 2nd Runner Up to Norma Beatriz Nolan of Argentina. 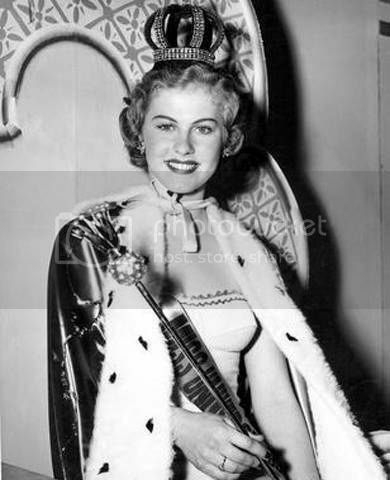 Anja also did not win Miss Finland but was only 2nd to Kaarina Leskinen who would only go on to win Miss Scandinavia and competed as well in Miss Europe 1962. 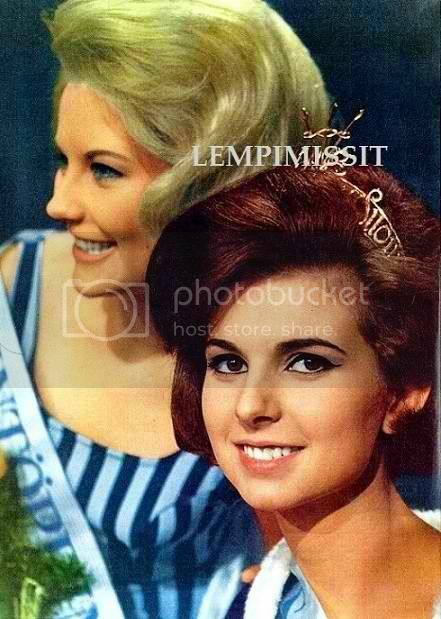 Anja Jarvinen, right, is 1st Runner Up to Miss Finland 1962. 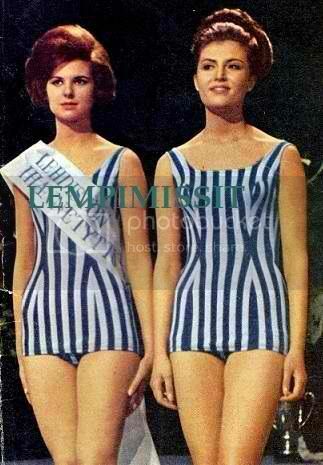 This started the streak of Finland at Miss Universe during the 60s. Anja Aulikki Jarvinen is 2nd Runner Up in MU1962. In 1963 Riitta Anja Hellevi Kautiainen is a Top 15 semifinalist. 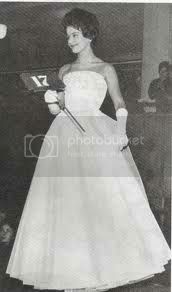 Sirpa winning Miss Finland 1964. 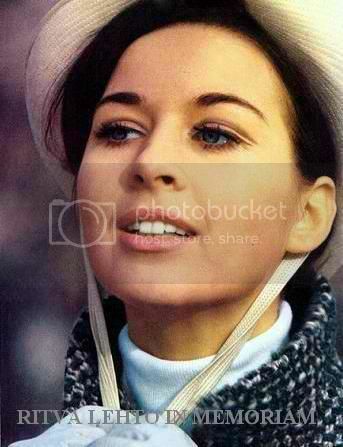 The undeniable natural beauty of Sirpa Wallenius, Miss Finland 1964. 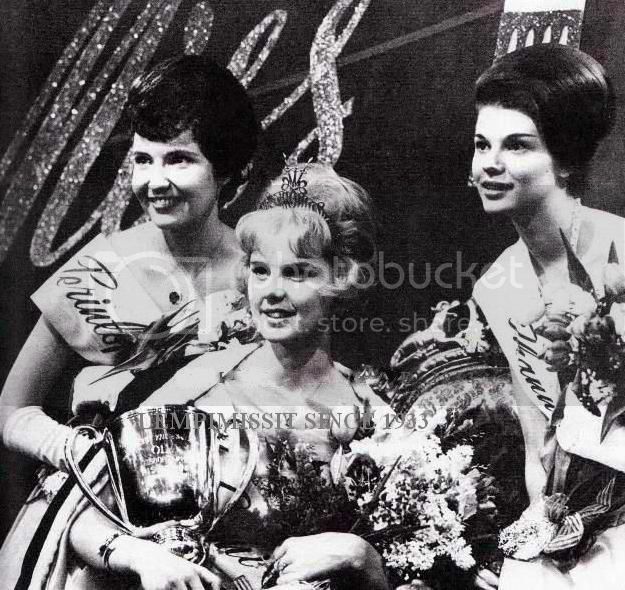 In 1965 Virpi Miettinen almost snatched the Miss Universe crown for Finland again, only to miss it by a shot to Thailand's Apasra Hongsakula. 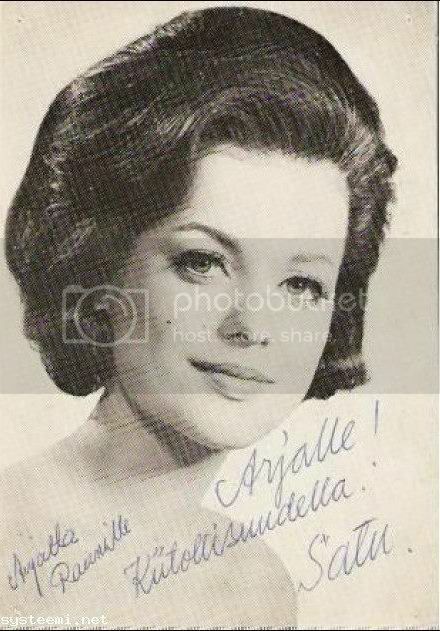 Virpi Miettinen wins Miss Finland 1965. 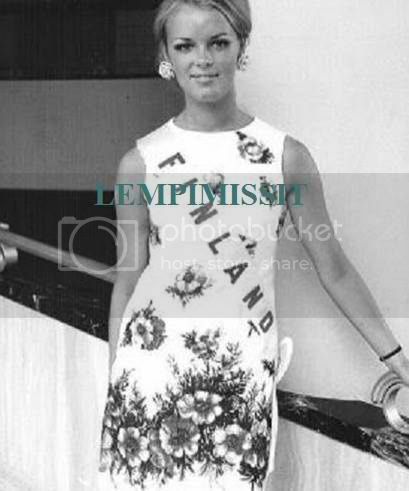 She was also 2nd Runner Up to Miss Scandinavia 1966 and 1st Runner Up to Miss Europe 1965. In 1966, Finland enjoyed a back-to-back 1st Runner-Up placement, the very first of its kind in the history of Miss Universe, with Satu Charlotta Ostring. Satu Ostring wins Miss Finland 1966. 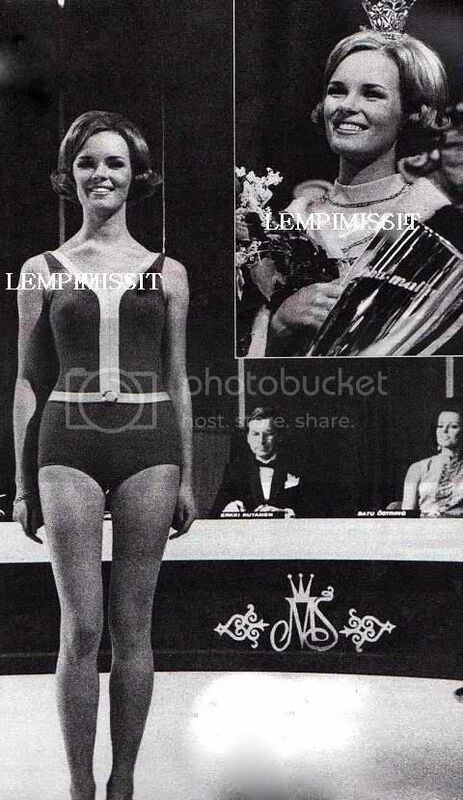 In 1967, Finland once again entered the Top 5, with the stunning blue-eyed brunette, Ritva Helena Lehto, 174cm tall, finishing 3rd Runner Up to Sylvia Hitchcock of the United States. Ritva in her national costume during MU1967 in Miamia Beach, Florida. The stunning Ritva Lehto. What a fresh beauty. In 1968, for the fourth consecutive time, Finland, in the person of Leena Marketta Brusin, once again entered the Top 5 of Miss Universe 1968 in Miami Beach, finishing 2nd Runner-Up to Martha Vasconcellos of Brazil. The tall, beautiful, blue-eyed blonde Leena Brusin wins Miss Finland 1968. Leena placing 3rd to MU1968. 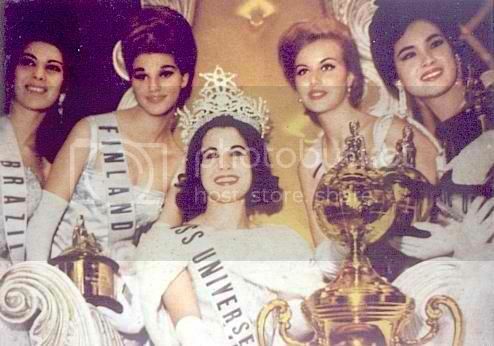 In 1969, for the fifth consesutive time, Finland, once again entered the Top 5 of Miss Universe with Harriet Marita Eriksson, finishing 2nd to Gloria Diaz of the Philippines. This is also Finland's third 1st Runner Up finish in just 5 years. 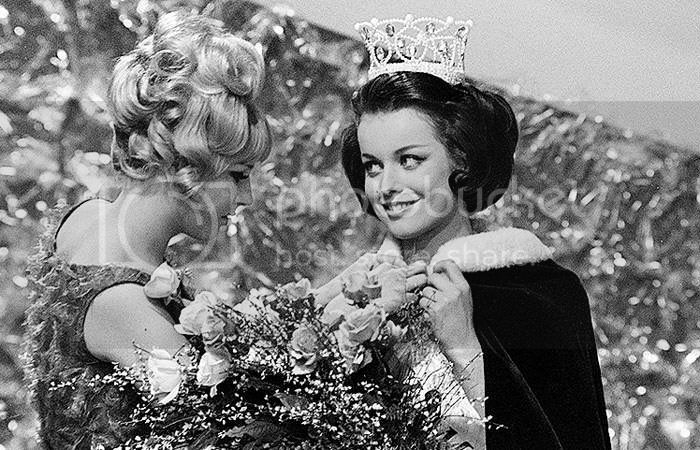 Harriet Eriksson during the Miss Suomi 1969 Finals. 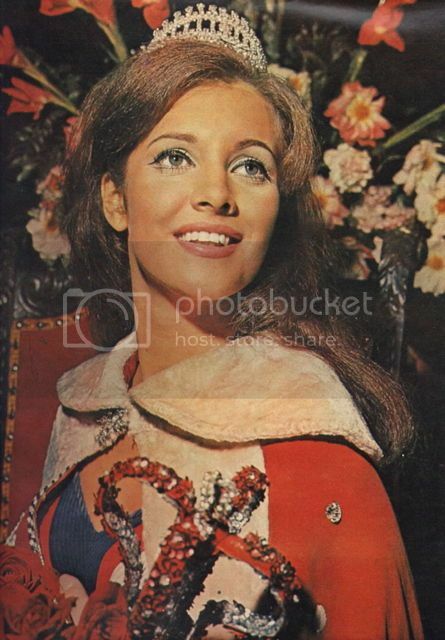 Harriet during her Miss Europe 1969 stint. The stunning 176cm tall blonde, Harriet Eriksson during Miss Universe 1969 in Miami Beach. The 60s was the golden decade for Finland. It had three (3) 1st Runners Up, two (2) 2nd Runner-Up, one (1) 3rd Runner-Up, one (1) Top 10 semifinalist, and one (1) Top 15 semifinalist. Overall is it a 8/10 placement in a decade, however, still wanting and aiming for a second Miss Universe crown, in which they still have to waot for another 5 years more. In 1970, Finland elected the very beautiful 19 years old, 172cm tall, Ursula Rainio as Miss Suomi but failed to place in the semifinals. Not a good Finnish start for the 70s. The blonde Ursula Rainio failed to place at Miss Universe but placed both in Miss Europe and Miss Scandinavia. 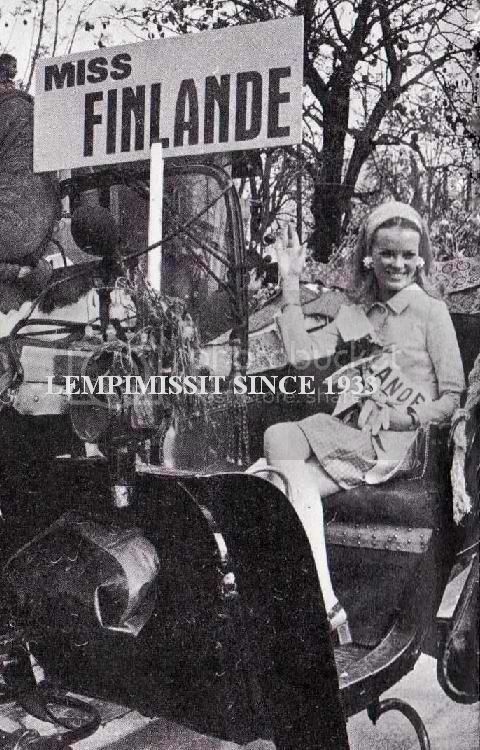 In 1971, Miss Finland Pirjo Aino Laitila paved way for another Finnish Top 5 finish at Miss Universe. She was 2nd Runner-Up to Georgina Rizk of Lebanon. Pirjo Laitila, 2nd from right, finished 3rd in Miss Universe 1971. 1972 and 1973 were not a great year again for Finland. The stunning 175cm tall, blue-eyed blonde, Maj-Len Eriksson went unplaced in Dorado, Puerto rico in 1972 eventhough she was tipped as one of the front-runners for the crown (Maj-Len Eriksson-Groenholm died of breast in 2009), and Raija Kaarina Stark was unplaced in Athens, Greece in 1973. Maj-Len Erikkson in one rare photos with former Suomen Neito and Miss Suomi winners during the early 70s. 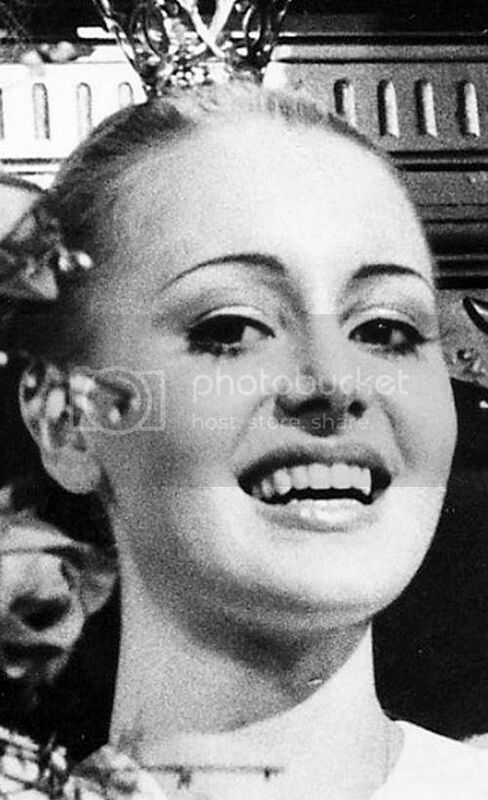 Raija Stark, Miss Suomi 1973, finishing 4th runner Up to Miss Sacandinavia 1974. 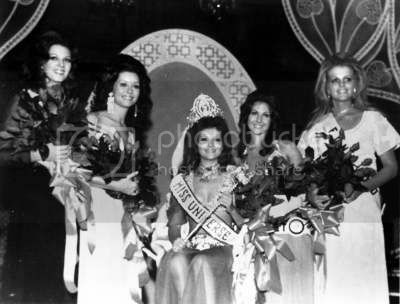 In 1974, Finland ricocheted to the Top 5, once again, in Manila, The Philippines with Riita Johanna Raunio finishing 2nd Runner-Up to Amparo Muñoz of Spain. Finland arrived in Manila as one of the mega favourites by the locals and the press. She was awarded Miss Photogenic by the pool of press photographers. Her green eyes and blonde hair were a hit to the Filipino fans. Riita Johanna Raunio receives her photogenic trophy at MU1974 in Manila. Johanna Raunio during the Press Presenation of MU1974 in Manila. Cute-sy. Blonde Johanna sticks her tongue out. Riita Johanna Raunio. Beautiful blonde (and not dumb). Come 1975, that is 23 years after Finland won the very first Miss Universe, Miss Suomi 1975 Anne-Marie Pohtamo won the highly coveted Miss Universe crown in San Salvador, El Salvador upsetting mega-favourite Summer Batholomew of the United States and Catharina Sjödahl of Sweden. The crowd went booing in disagreement to the calling of Miss Sweden, Catharina Sjödahl as 3rd Runner Up. Finland got 6 #1 and 2 #2 votes whilst Gerthie got 3 #1 and 6 #2votes. It was a close fight, but Finland emerged victorious in the end. Exotic and elegant Miss Philippines have to settle for 5th for once again giving a mediocre answer to the final question. Typical yet unassuming Scandinavian beauty - that is Anne-Marie Pohtamo, bubbly, beautiful, tall and straightforward, giving her MU1975 crown. Anne-Marie Pohtamo, MU1975, flanked by Rosemarie Singson Brosas (Philippines) - 4th RU; Catharina Sjodahl (Sweden) - 3rd RU; Gerthie David (Haiti) - 1st RU, and Summer Bartholomew (USA) - 2nd RU. Finland would not place again until 1982. However, delegates from 1976 to 1979 also great competition to Miss Universe, as Finnish delegates are always being watched for. Suvi Lukkarinen, Miss Finland Universe 1976, though also a favourite just did not make it to the semifinals along with Miss USA Barbara Peterson. In 1977, Finland once again sent a blonde stunner Armi Anja Orvokki Aavikko. A heavy favourite and one of the most noticeable delegates in Sto. Domingo, the Dominican Republic, Armi Anja went unplaced at the end of the finals. Classic beauty. Who would have thought that this SPECTACULAR blonde beauty will be ignored at MU1977? 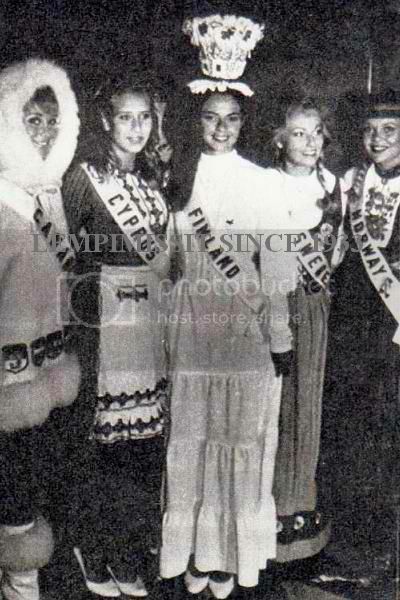 1978 & 1979 seemingly are the erroneous years for Miss Suomi. They elected average beauties Seija Kaarina Paakkola as Miss Suomi 1978 and Paivi Uitto as Miss Suomi 1979. Is Miss Suomi 1978 Seija Kaarina Paakkola a wrong choice in 1978 for Finland? A repetition of wrong Finnish winner. Paivi Uitto wins Miss Suomi 1979 as the beautiful Kate Nyberg has to settle for 3rd. Robbed. The stunning, striking, statuesque blue-eyed blonde, Kate Nyberg may have placed 3rd in Miss Suomi 1979 but she placed 3rd RU in Miss International 1979 and won Miss Scandinavia 1980. Overall, it was a a fair performance for Finland in the 70s.Two (2) 2nd Runners-Up and One (1) Winner.it can be noted that since 1965, when Finland enters the semifinals, it always penetrates through the Top 5. 3/10 for Finland in the 70s. The 1980s is a little shaky for Finland. They started weak in 1980 with the election of light red-haired Sirpa Viljamaa as Miss Suomi 1980. Sirpa, the second Miss Suomi of the same first name, was a fair choice from a pool of average contenders for Miss Suomi crown. It is actually how Sirpa will transform that will determine her performance at Miss Universe. Since Finland is highly respected at Miss Universe during that time, Sirpa was still expected to do well and came to Seoul in great shape and nice wardrobe but ended up empty-handed. 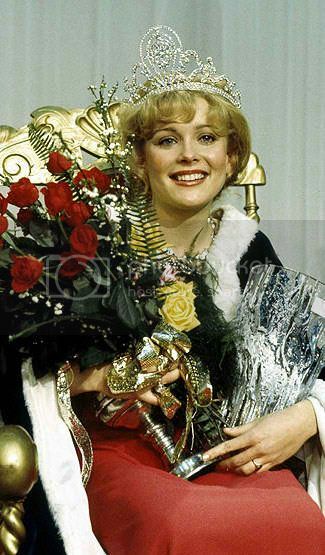 Sirpa Viljamaa upon winning the first Miss Suomi crown for the new decade, the 80s. Charismatic Sirpa. She won Miss Suomi as an average looking girl but arrived in Seoul as one light-red hair charming girl winning hearts of the locals. But still not enough for the judges. Swimsuit mystery? Well-prepared, fit, shaped and well-groomed Sirpa Viljamaa in lavender swimsuit with fellow Scandinavian delegates, only to be left empty-handed in Seoul, Korea with a very shameful swimsuit scores 6.638 that hurt her chances, leaving her at the bottom 15 contestants in swimsuit among the 69 delegates competing for the pageant. In 1981, Miss Suomi seemingly really wanted to make it again to the Miss Universe finals with the election of 177cm tall green-eyed blonde Merja Orvokki Varvikko as Miss Suomi 1981. Merja travelled to New York City, arriving as one of the front-runners for the crown, as always expected for Miss Finland. Merja finished 6th in the preliminary swimsuit competition just few point behind eventual winner, Irene Saez of Venezuela with 8.375 (4th). Kim Selbreede of USA topped the preliminary Swimsuit Competition with 8.510 (1st). However, come the finals night, the whole Minskoff Theater was surprised seeing Miss Finland clapping at the background. Stunning Merja Varvikko, 3rd from left, during MU1981 in New York, United States. Fit and fab, Merja Varvikko, placed 6th in Preliminary Swimsuit Round but was nowhere in the Final Top 12. 1982 was another great year for Finland, once again, Miss Suomi 1982 Sari Kaarina Aspholm arrived in Lima, Peru as one of the favourites of the locals and the press alongside with Miss South Africa, Odette Scrooby; Miss Brazil, Celice Marques; Miss Guam, Patty Chong Kerkos; and Miss Greece, Tina Roussou. All of them made it to the semifinals, however, only Guam and Greece entered the Top 5. Eventhough Sari Kaarina placed 5th in the preliminary Swimsuit Competition, it seems during the Finals, judges were not voting for Sari Kaarina's beauty as she seemed to feel tired with her lackluster performance (though undeniably with extreme facial beauty) finished 10th among the 12 semifinalists with composite average scores of 7.708. However, few months later, Sari Kaarina Aspholm almost won the Miss World crown with just 2 votes short of eventual winner Mariasela Alvarez Lebron of the Dominican Republic. 176cm tall, blue-eyed blonde, Sari Kaarina Aspholm during the Evening Gown segment of Miss Suomi 1982. In 1983, Miss Universe was held in Kiel Auditorium in St. Louis, Missouri. Once again, a stunning dark-blonde and hazel-eyed Nina Marjanna Rekkola was sent by Miss Suomi Organization. Nina placed 6th in Preliminary Swimsuit round with 8.065 tied with Miss Italy, Federica Maria Moro. 175cm tall, Nina Marjanna winning Miss Suomi 1983 without any near competitor. Screencap of Nina Rekkola during the Top 12 semifinal interview of MU1983 in St. Louis, Missouri. Nina during the semifinal swimsuit competition of Mu1983. She scored 8.888 (9th) and liek her predecessor Sari Kaarina, finished 10th overall out of 12 semifinalists. 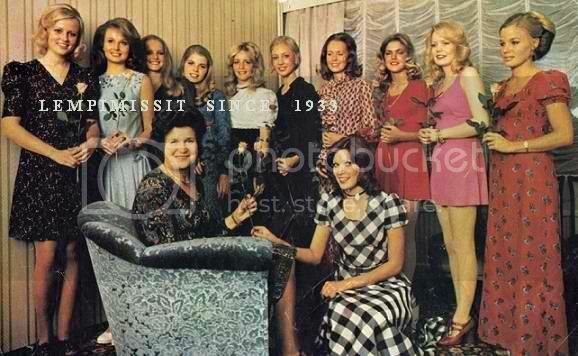 Nina, with other contestants backstage, during Miss Suomi 1983 Finals. Personally, Nina Rekkola's horrendous coiffure and bad make-up ruined her chances at MU1983. 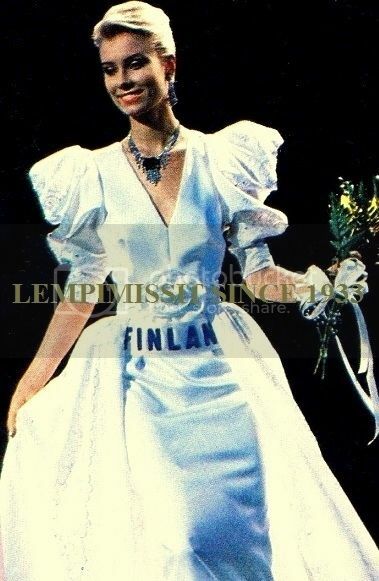 In 1984, Miss Suomi elected, Anna Liisa Tilus, probably the most beautiful Miss Finland of the 80s. 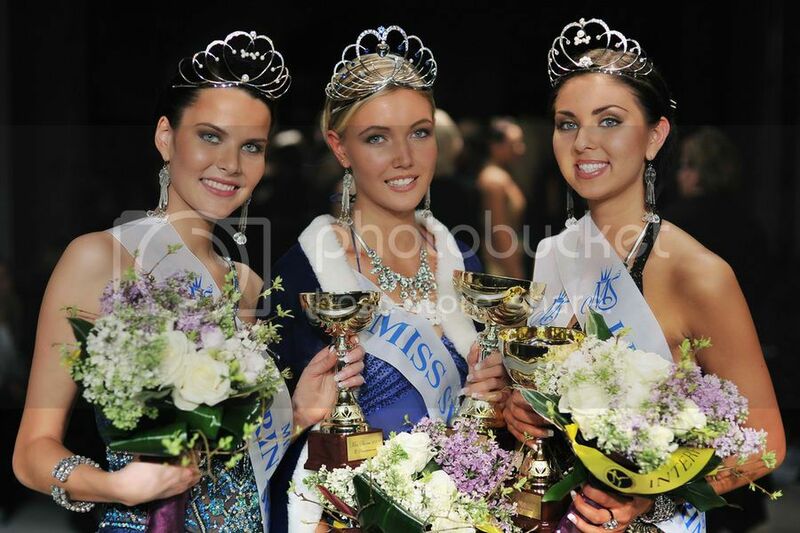 Tall (at 1,76cm), hazel-eyed dark-brown haired and very beautiful, Anna Liisa won Miss Suomi also in a unanimous decision from the panel of judges. Anna Liisa came to Miami Beach strongly, and highly favoured to win the crown behind her roommate and close friend during the pageant, Miss Sweden, Yvonne Ryding who eventually won the crown. Anna Liisa finished 10th during the preliminary swimsuit round but sadly was not called among the Top 10 semifinalists came the finals night. In 1984, semifinalists were reduced to Top 10, from the usual Top 12, which may have caused Anna Liisa's placement in the semifinals. Observers believed she placed either 11th or 12th. Stunning Anna Liisa, uncontested during the EG segment of Miss Suomi 1984. Anna Liisa, center, and other contestants backstage during the presentation show of mU1984 in Miami. Rare photos. Bestfriends during the pageant. Sweden's Yvonne Ryding and Finland's Anna Liisa Tilus. Both were expected to place, but only Yvonne advanced. Anna Liisa and Yvonne having fun at Miami Beach. Anna Liisa and Yvonne after the latter's victory. In 1985, Finland tried the same old formula to place again at Miss Universe with the election of another blue-eyed blonde stunner Marja Kinnunen. Marja, a 174cm tall native of Helsinki, was also within the radar of pageant experts and critics in Miami Beach. She was an early favourite but only, once again, not favoured by the judges. Seemingly, Finnish beauties are possessing great facial beauty and nice body but tend not to place due to subdued performance and some luck not favouring their side during those times. Stunning blonde, Marja Kinnunen, should have competed strongly had she entered the semifinals. In 1986, a 174cm tall blue-eyed blonde stunner Tuula Polvi represented Finland at Miss Universe 1986 in Panama City, Panama. Once again, Finland competed stringly and reached the Top 5 finalists, together with Misses Poland, USA, Colombia and the eventual winner, Venezuela,. Tuula entered the Top 10 semifinalists in 3rd place but finished 4th Runner-Up during the Final Telecast of the Pageant. She competed strongly against mega-frontrunners Christy Fitchner of the USA and Barbara Palacios of Venezuela. Probably, the most elegant evening gown worn by any Finnish delegate in the 80s. Tuula's performance is perfection. Outi competed strongly. A sure-placer for Finland, as expected, but drastically failed to advance among the Top 10 with the very outdated and ugly "gourd-inspired" white evening gown, despite placing 8th in the preliminary swimsuit competition with a score of 7.877. Outi Tanhuanpää wins Miss Suomi 1987. Unforgettable beauty of Outi Tanhuanpa. 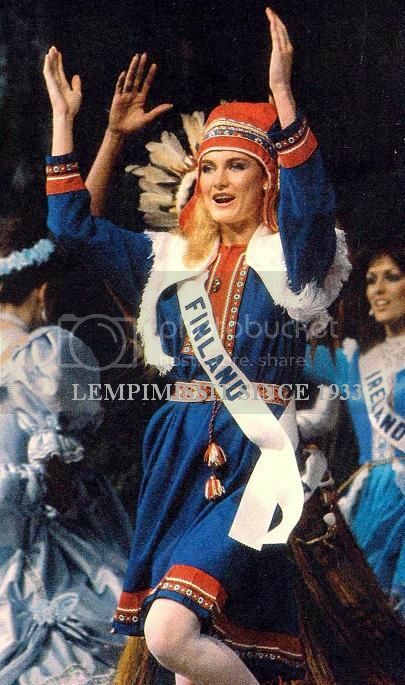 Outi displays her Finnish National Costume during the preliminaries if MU1987 in Singapore. Outi during the Preliminary SS Competition of MU1987 in Singapore finishing 8th only for this segment. In 1988, Finland gave the Universe the 177cm tall blonde Nina Carita Bjornstrom. She was a highly decent choice for Finland, and came out very strong in Taipei, Taiwan. However, finishing 27th during the preliminary swimsuit competition at 7.733. Nina Carita was very visible during the pageant, one of the most photographed contestants. But Asian delegates were favoured strongly, paving way for the exclusions of stunners from Costa Rica (Erika Paoli), Finland, among others. Nina's poor swimsuit performance can be attributed to the extreme heat in Taipei during that time causing her to collapse nackstage during the preliminary swimsuit segment of the pageant. Nina Bjornstrom. Spectacular, Finland during those times is the Colombia of Europe while Sweden is the Venezuela of Europe. Nina during the preliminary swimsuit recording. Nina Bjornstrom arrives in Taipei. Nina during the opening number of Mu1988, expectant to enter the semis, but did not. Nina Bjornstrom collapsed at the backstage of MU1988 preliminaries due to extreme heat. This might have been the cause of her lackluster performance in the preliminaries despite being a front-runner. Åsa Lövdahl, a brunette, wins Miss Suomi 1989. Miss Suomi 1989 Asa Lovdahl and Froken Sverige 1989 Louise Drevenstam, both entered the semifinals of Mu1989 in Cancun. Pretty, tall and brunette. Asa Maria has what it takes to became MU1989 but only to falter, again, in the Evening Gown. The culprit, again? Bad silhouete, bad taste, bad gown for Asa Maria causing her to finish 9th (8,755) during the EG Segment of MU1989 in Cancun. She also placed 9th in SS (8.661) though I think she was underscored and 4th int he interview with the score of 8.533. Overall, Asa finished 8th with a composite score of 8.650. The 80s have been fair for Finland. one (1) 4th Runner-Up, and three (3) Top12/10 semifinalists. Overall, 4/10 is a highly fair performance for a country. The 90s marks the dwindling of Finnish performance at Miss Universe. The glamour and prestige that was Finland in the 60s and 70s are slowly going down the drain staring this decade, eventhough they kept on sending stunners during the early 90s. In 1990, Finland's Tiina Susanna Vierto, 19 years old, 173cm tall, finished 16th in the preliminaries of Miss Universe held in Los Angeles, California. This starts the continuous faltering of the Finnish formula in Miss Universe. They would not place again until 1993. Tiina Vierto suprisingly had to compete with a very strong 1990 batch. Beautiful yet unplaced, Tiina Vierto, Miss Finland 1990. In 1991, Miss Suomi Tanja Vienonen, a 176cm tall blonde stunner was sent by Finland in Las Vegas. Tanja was tipped to make it to the semifinals alongside with Jackeline Rodriguez (Venezuela), Lupita Jones (Mexico), Yulia Lemigova (USSR), Kimberley Mais (Jamaica) and Jacqueline Kriejger (Curacao). All made it to the semis except Tanja. Undeniably gorgeous, Tanja Vienonen, Miss Finland Universe 1991, but finished only 16th overall. In 1992, it seems Finland always got it right with the crowning of 22 years olf, 179cm tall blue-eyed and light-brown haired, Kirsi Syrjänen. Kirsi Syrjänen's winning of Miss Suomi 1992 was not that easy, as another stunner 19-year old, 179cm tall brunette named Kirsi-Mari Ketola was her greatest competitor for the crown. At the end of the night, it was Kirsi vs Kirsi. And Kirsi Syrjänen confirmed her favouritism and won the Miss SUomi 1992 title. Kirsi Syrjänen came to Bangkok competing very strongly as locals rooted her as one of the front-runners. But seemingly, luck was not on her side as she finished 15th overall in the preliminaries with a composite score of 8.717, only 0.056 point short to enter the Top 10. For three years in a row, 3 Finnish stunners were ignored at Miss Universe, but can be found very near the Top 10. Kirsi Syrjänen winning Miss Suomi 1992 whilst another stunner Kirsi-Mari Ketola (right), has to settle for 2nd place. Kirsi in her official MU1992 Swimsuit. She scored 8.81, ahead of other Top 10 semifinalists, Shannon Marketic (USA) 8.79, Georgina Denahy (Australia) 8.54 and Monica Brodd (Sweden) 8.66. Kirsi Syrjanen with neighboring Scandinavian delegates to MU1992, Anne Sofie Galaen (Norway) and Monica Brodd (Sweden). Stunning! Kirsi Syrjanen in her dance wear for MU1992 intermission dance. 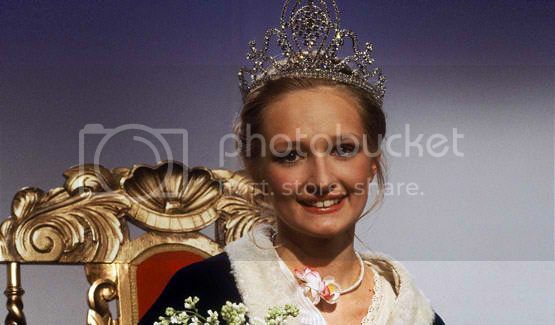 In 1993, another green-eyed blonde stunner Tarja Smura won Miss Suomi 1993. Tarja is seemingly has the most beautiful face of any Miss Finland of the 90s. Tarja arrived in Mexico City very strong with her soft demeanor and angelic face. She was a major front-runner finishing 2nd overall in the preliminary swimsuit competition with 9.26 points behind Australia's Voni Delfos with 9.41. Tarja entered the Top 10 in 7th place with a composite semifinal score of 9.183. Tarja, a little subdued and with not-so-spectacular catwalk, lost her spark during the Finals Night in Mexico City finishing 9th overall, eventhough she faired well in the semifinal interview placing 4th (9.154). Her atrocious evening gown (very common for Misses Finland in the past) also caused her chances of getting into the final 5. Tarja Smura winning Miss Suomi 1993, uncontested. Angelic face, that is Tarja Smura. The very beautiful Tarja Smura during the Miss Suomi 1993 finals. The body that made her placed 2nd during the preliminary SS segment of MU1993 in Mexico, only to be scored 7th in the Final SS Competition due to lackluster catwalk. The prime suspect, for the nth time for Finland. Horrendous gown for Tarja Smura. 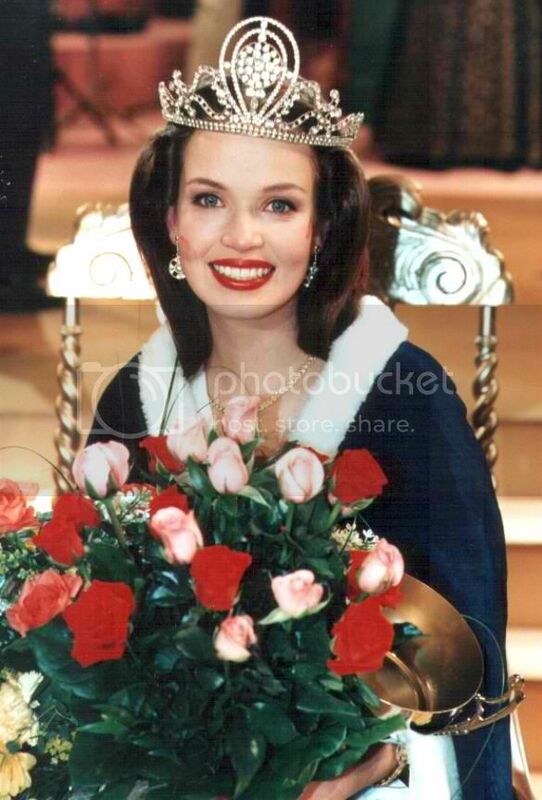 In 1994, Miss Suomi, in a very unexpected move, surprisingly elected an average beauty, 19 years old, 178cm tall Henna Merilainen as Miss Suomi 1994, leaving behind the super beauty Marja Vuoristo in 3rd place, This is one great upset result in the history of Miss Suomi. Henna Merilainen wins Miss Suomi 1994 whilst superbeauty Marja Vuoristo, left, had to settle for 3rd. Henna had one of the lowest scores for any Miss Finland in the last 20 years at Miss Universe, ranking 55th out of 77 contestant in the preliminary competition of MU1994 in Manila, The Philippines. Her composite preliminary score is 8.393. Scandinavian beauties. Caroline Saetre (Norway), Svala Bjork Arnardottir (Iceland), Gitte 'Tina' Anderson (Denmark), Dominique Forsberg (Sweden) and Henna Merilainen (Finland) at the poolside of The Manila Hotel. Only Sweden advanced to the semifinals. In 1995, Finland offered 176cm tall, green-eyed brunette stunner Heli Pirhonen. She was a major favorite the moment she arrived in Windhoek, Namibia, only be ignored in the preliminaries. Heli suprisingly equalled the feat of her predecessor Henna Merilainen ranking 55th as well in the preliminaries. She scored 8.553, another wasted Finnish beauty. 1995 was also a European shutdown at Miss Universe as not even a single European made it to the semifinals. The nearest to the Top 10 is Russia's Yulia Alekseeva with a composite preliminary score of 9.083. The very beautiful and elegant Heli Pirhonen winning Miss Suomi 1995.
Who can ignored this Finnish brunette but the judges at MU1995 in Windhoek? Heli met with Sam Nujoma, then President of Namibia. Scandinavian beauties. Lena Sandvik (Norway), Heli Pirhonen (Finland) and Petra Hultgreg (Sweden). Petra, a Claudia Schiffer deadringer was named Miss Photogenic. The major Finnish error, again! Beautiful delegate, ugly gown. Poor Heli. In 1996, Finland elected its very first Miss Suomi of colour - Iyabode Ololade "Lola" Remilekun Odusoga. At 174cm tall, Lola Odusoga is a ballroom dancer born to a Finnish mother and a Nigerian father. Lola competed at MU1996 in Las Vegas, Nevada, USA, being one of the early favourites and live with the hype she got from the press. She entered the Top 10 on the edge at 10th place (8.940), neck in neck with another European stunner Laure Belleville of France with a score of 8.877. Lola's amazing catwalk and great stage presence paved her way to score high during the final competition which made her enter the Top 6 finalist in 5th place at 9.642. She then entered the Top 3 in 3rd place at 9.763. Beautiful ebony beauty - Lola Odusoga, unconventional win as Miss Suomi 1996. Beautiful and bubbly, Lola Odusoga in Las Vegas. Stephanie Berger (Switzerland), Ali Landry (USA), Renette Cruz (Canada) and Lola at the poolside of Aladdin Resort and Casino, Las Vegas. At the end of the night, Lola was named 2nd Runner Up to the amazing Alicia Machado of Venezuela. Nobody predicted that this would be Finland's last placement to date. In 1997, Finland elected a light-brown eyed, light brown-haired 177cm stunner Karita Tuomola as Miss Suomi 1997. Karita is expected to bring a second consecutive placement for Finland only to find herself in 18th place in the preliminaries with a composite score of 8.850. India's Nafisa Joseph (who later committed suicide in July 2004) placed 10th at 8.967. Karita Tuomola wins Miss Suomi 1997. A well-deserved victory. Beautiful yet not enough for Top 10. Karita Tuomola in her National Costume during Mu1997 in Miami Beach. In 1998, Finland elected the blue-eyed blonde Jonna Kauppila leaving, again, the tall and beautiful brunette Mandi Malek in 2nd place. Jonna did not make much waves in Hawaii in MU1998 but she did fairly well but not enough to advance to the Top 10 semifinalist. Jonna Kauppila wins Miss Suomi 1998 whilst Mandi Malik, left, had to settle for 2nd. 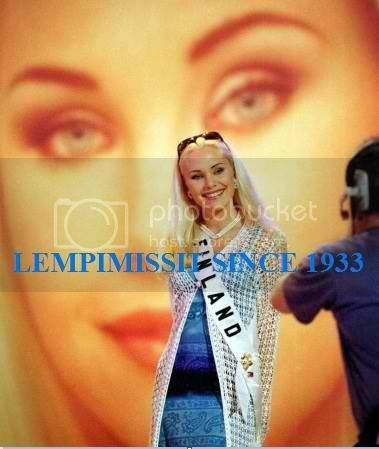 The last hope for the decade, in 1999, Miss Suomi gave171cm tall, blue-eyed blonde Vanessa Forsman. Vanessa is a very pretty face but not well-package enough to be highly favoured in MU199 held in Chaguaramas, Trinidad & Tobago. The last hope for the decade and for the millenium, Vanessa went home empty handed. 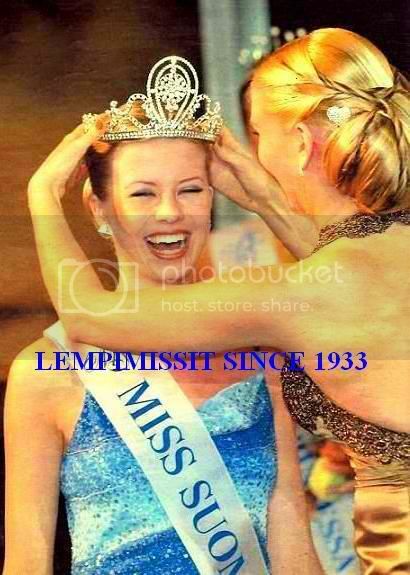 Last Miss Suomi for the millenium. Vanessa Forsman wins Miss Suomi 1999 whilst stunning Saija Palin (left) finished 3rd. Vanessa Forsman headshot. Beautiful blonde but not Miss Universe enough? Vanessa Forsman compete at MU199 preliminary EG competition. The usual waterloo of any Finnish delegate the past 2 decades - poor evening gowns. The 90s did not end up good for Finland. Overall, one (1) 2nd Runner-Up, one (1) Top 10 semifinalists. 2/10 placement in a decade of changes in Miss Universe Organization - Trump bought Miss Universe and revamped the pageant to new dimension and reinvented to cope up with changing times, but Finland was seemingly is having a hard time to go with the tides. Since the entrance of the new millenium, no Finnish delegate has ever advance to the semifinals of Miss Universe. 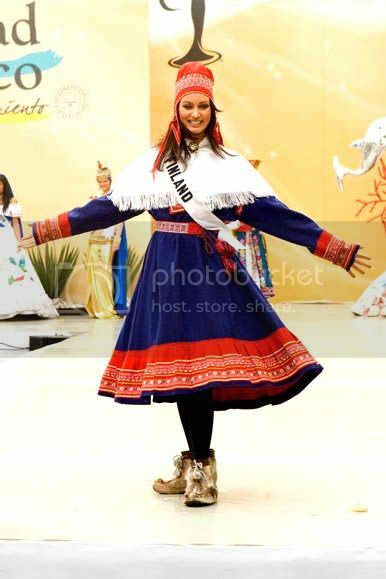 In 2000, a very beautiful 19 year old, 177cm tall, blue-eyed, brown-haired Suvi Miinala won Miss Suomi 2000, expectant to be favoured in Miss Universe 2000 in Nicosia, Cyprus only to end up clapping. Usual reason for unplacement is bad packaging, poor catwalk and unflattering evening gown for Suvi. Suvi Miinala wins Miss Suomi 2000. The first Finnish Queen for the millenium. Finland sends good girls, but the changing Miss Universe standards make it hard for them to place. Finland seemingly finds it hard to get the formula of new Miss Universe system. They send beautiful girls most of the time, but the packaging is kinda left on the 70s-80s era. 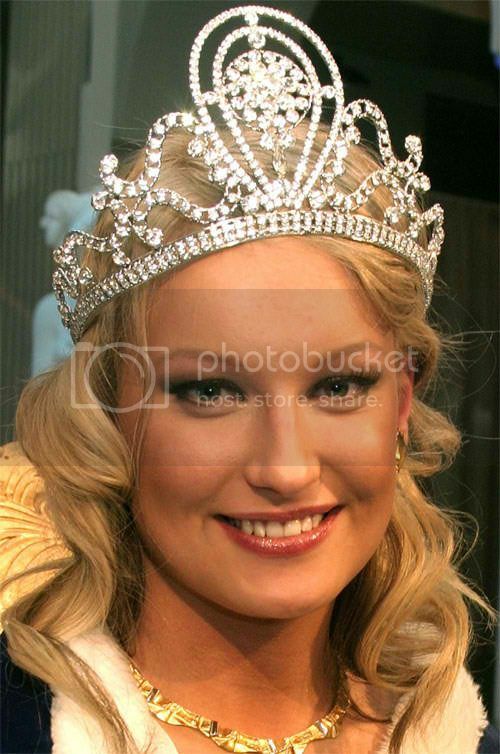 In 2001, brown-eyed blonde Heidi Willman was crowned Miss Suomi 2001. 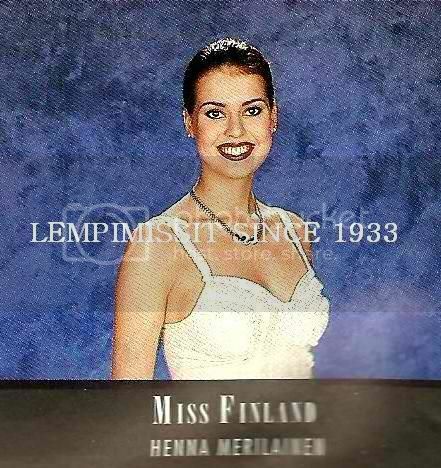 She represented Finland at MU2001 in Bayamon, Puerto Rico but also did not place. Heidi Willman, Miss Suomi 2001 - the best that Finland can offer that year. Beautiful girl but nothing more. Heidi Willman was eaten alive by the glamazons of MU2001 in Bayamon. In 2002, Janette Broman won Miss Suomi and represented Finland in Mu2002 in San Juan, Puerto Rico. 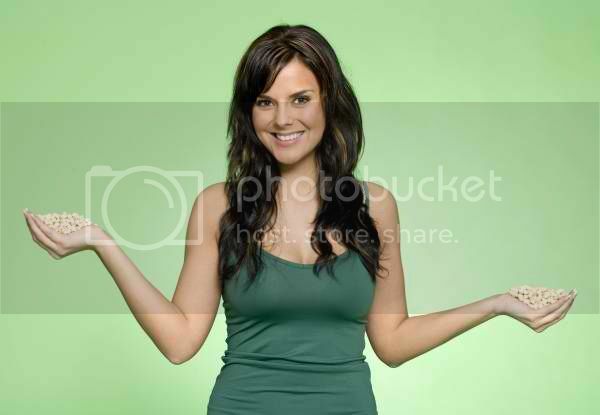 Janette is a fair choice among mediocre pool of Miss Suomi contestants that year. She was unnoticed and not among the favourites in San Juan. She did not place, as expected. Janette Broman reacts as she was crowned Miss Suomi 2002. Weight gain? Unflattering body of Janette Broman during the preliminary SS competition of MU2002 in San Juan, PR. 2003 is another WTF moment for Finland with the election of plain jane Anna Maria Strömberg as Miss Suomi 2003. The only interesting with this girl is her family name which happens to be the name of the villain in James Bond movies. As expected, Anna Maria did not place at MU2003 in Panama City. In 2004, Finland seemed to find it right with the stunning blue-eyed light-brown haired, 175cm tall stunner Mira Salo as Miss Suomi 2004. Mira is on and off to favourites radar during the competition in Quito, Ecuador. But her un-curvaceous body ruined her chances to be catapulted to the Top 15 semifinalists with a pool of spectacular contenders during that year. Mira Salo wins Miss Suomi 2004. A major upgrade from the previous year. Mira Salo waves for the press in Quito, Ecuador. Mira Salo competes during preliminary SS competition for Miss Universe 2004 in Quito. Stunning. Mira Salo is very beautiful but was not favoured by the preliminary judges nor Donald Trump. In 2005, Finland once again got it all wrong with the election of another bland blonde Hanna Ek. Hanna passed unnoticed in Bangkok, Thailand and did not do anything to reverse Finland's dwindling fate at Miss Universe. Hanna Ek, unexpectedly won Miss Suomi 2005. Miss Finland 2005, Hanna Ek in Thailand beach. 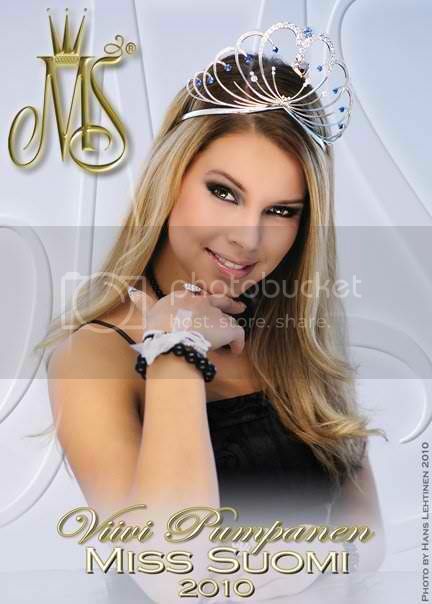 In 2006, Finland has chosen 20-year old brown-eyed blonde, Ninni Laaksonen as Miss Suomi 2006 thereby gaining the right to represent Finland at MU2006 in Los Angeles, California. Ninni was a great competitor but her performance was just not enough to penetrate the Top 20 semifinalists that year. Done everything right. Miss Finland, Ninni Laaksonen sashayed her full-length light-golden evening gown during the 2006 Presentation Show at Kodak Theatre, Los Angeles. In 2007, a beautiful blue-eyed brunette, 175cm tall, Noora Haukatangas won Miss Suomi and represented Finland in MU2007 in Mexico City. Noora, though facially stunning, never made it as a favourite nor even made it to the actual Top 15. A Finnish ray of hope, gone gray. Noora Haukatangas wins Miss Suomi 2007 but was not able to make it to the semis, again. In 2008, a 176cm tall, green-eyed brunette Satu T won Miss Suomi 2008 and represented Finland in Nha Trang, VietNam. Expected to do well in the pre-arrivals, Satu started to lose grounds during the actual competition. She seemed to gain a little weight and sported a boring dress (again, as expected) in the preliminary EG competition. Satu Tuomisto is Miss Suomi 2008. Satu competes in the preliminary SS competition in VinPearl Resort, Nha Trang, VietNam. Satu obviously gained weight. Satu competes in the preliminary EG competition in Nha Trang. Again, bad gown choice ruined Finland's chances. Natural Finnish beauty that is Satu Tuomisto. In 2009, Finland gave a 175cm blue eyed, blonde Essi Pöysti as Miss Suomi 2009, represnting Finland in Atlantis Paradise Resort, The Bahamas. Essi should have been the last Finnish hope for the first decade of the millenium. This Lisa Kudrow deadringer did everything right for her to get noticed but her mediocre facial beauty makes her less standout that the pool of glamazon beauties in the Bahamas. Essi Poysti, Miss Finland 2009, Top 15 only during dress rehearsals. The 2000s is the worst decade ever for Finland. Although presented a handful of girls with potentials, all did not place. Bad packaging is the common cause eventhough in some years, they send really mediocre girls. Overall, 0/10 for Finland. The dark decade for this nation which used to place almost every other year. Come 2010, the pageant followers are always expectant of a grand Finnish comeback. But the Miss Suomi Organization seem to be losing grounds and lacking support system in their native country. The traditional pageant has been struggling with sponsors, TV rights and good girls to compete. Viivi Pumpanen won Miss Suomi 2010. The 169cm tall blonde did everything to be noticed and to place at MU2010 held in Las Vegas. Viivi was even in front during the SS production number of the pageant. But the overflowing Latin beauties and other strong contenders from the Old Continent made it hard for Viivi to enter the Top 15. Viivi Pumpanen. Beautiful and fit, yet a little short. Not quite passing to current Miss Unievrse trends? Viivi Pumpanen prepares for EG competition backstage. In 2011, spectacular Pia Pakarinen was enlisted as among the favourites to at least make it to the Top 16 semifinalists. Pia has one of the most beautiful faces of 2011 batch only to be ignored by the judges and Donald Trump. Pia was expected to give Finland its first semifinalists after 1996 but failed. Later on, it was discovered that Pia did not get the support she needs from Miss Suomi organization and thereafter, resigned as Miss Finland 2011 and was replaced by her runner-up Sara Sieppi. Pia's disappointment poured in after the pageant realizing the Latin girls had tons of luggages of wardrobes while she only had a few for pre-pageant functions. The National Directors and their teams for Latin countries and even some from Europe and the Old Continent are present in the venue even weeks prior to the pageant while she did not have support until the finals night. Pia Pakarinen and her Miss Suomi 2011 court. Very beautiful and striking Pia Pakarinen. What went wrong? In 2010s, Finland gave the Universe two beautiful young women fit for Miss Universe crown but both failed to enter the semifinals. Finland seemingly is adapting to the modern day requirements of Miss Universe. But they need to exert more effort and they need to pamper more their representatives. Finland is a nation with lots of potentials, lots of stunning girls. There is just an incessant need to convince these girls to compete at Miss Suomi, and thereafter, train them, motivate them, dress them well, give them their due beauty regimens and so on. Finland will come back. It definitely will. Sweden has been improving the past 10 years, and I think Finland too can follow. Norway also is now lagging. 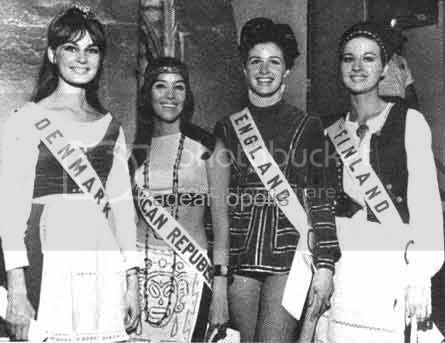 Scandinavian nations seem to lose great girls to compete since pageant is not anymore as famous as to the 60s. But there is always a hope for these nations, most especially for Finland which was once touted as the great powerhouse in Miss Universe. Wake up, Finland! Wake up! Please forgive me for some typographical errors. Was having a hard time scrolling up and down for editing. Last edited by bjoern28 on Sun May 13, 2012 1:35 pm, edited 2 times in total. I am Bjoern. I am Me. Love Me. Or Hate Me. Message: I am born missosologist! I challenge everyone for fastfact infos! Last edited by josephinemagsaysay on Sun May 13, 2012 12:07 pm, edited 1 time in total. Fresh. Innovative. Creative. Original. This is clearly a masterpiece and one of the best and longest threads here in Missosology. I love the concept and originality. My take on the issue is that Finnish delegates are just not that prepared because of the negligence of the directors of their National Pageant. I remember Pia Pakarinen resigning because of it. very Informative, great job bro!! Guys, thank you for your time reading my thread. Am sorry it is kinda very long and can make you feel lazy. But, if you have time, please do read. I made this for 3 days, that I had to skip 1 day of work, lol. Thank you, Shaymin, Miss Azerbaijan, dede22, Rhamie, NovemberRain, josephinemagsaysay , MissUnderstood and Colonel Sanders for reading. It is my pleasure to post threads and to be read by you, guys. Did you know that the very first Miss Universe as seen on the First Photo wore the very same crown of Catherine The Great of Russia loaned for the coronation night? My favorites Miss Finland are Pia Pakarinen, Lola Odusoga, and Sari Aspholm. Hey, terese23. Thanks for reading and for appreciating. Sorry for the slight mix up with the photos. I am actually still editing it. I think I placed the photo of Janette Broman to Anna Stromberg and a few others. I still need to edit, since it is hard to look for photos from archives and place each photo in photobucket and eventually posting the link for it to appear. I also have soft spot for Finland. I have been wanting them to place since 2007. Nevertheless, it is my pleasure to create threads if I have the time. Wow, this is one of the best threads I've read so far at Missolandia! Can you please do India next? I jesi ozbiljno iz Hrvatske ili ti to samo tako pise? AM NOT REALLY READING IT. I'M JUST LOOKING AT THOSE PICS AND SCROLL DOWN THEN LEAVE COMMENTS. BUT I BELIEVE IT WAS A GREAT EFFORT..
Finland has been clapping for almost 16 years. That is probably the best material available on the internet about Miss Finland history, amazing!!! So many stunning girls I didn't know. IMHO - Finland send delegates for goodwill reasons only, thus the lack of sponsors, training and among other things. They should have sent well-prepared, well-funded, blue-eyed, blonde girls if they really wanted to regain their powerhouse status. I must agree that Miss Universe is not as popular as it was before in Finland since they concentrated more on other ground-breaking activities such as sports. Being a Miss Universe is not as important I guess to Finnish ladies compared to the ladies from Colombia and Philippines. I read it all without any lose of interest. Amazing thread ! Beautiful thread! I can't wait for the next series. Wow, I enjoy reading it.. My 45 minutes are not wasted.. BRAVO. 30 MINUTES OF GOOD READING. THAT'S QUALITY POST WHICH I RARELY SEE @ MISSO NOWADAYS. AND YEAH, I CANT HELP BUT NOTICE WHY STUNNING RUNNERS UP NEVER RETURN TO TRY AGAIN. MARJA, FOR EXAMPLE, COULD HAVE EASILY WON IN 1995 AND CAN EVEN BE THE ONLY EUROPEAN SEMIFINALIST @ Miss Universe. 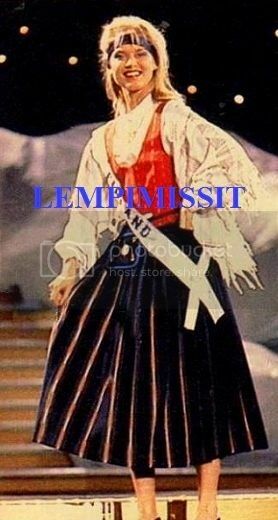 Pedro wrote: That is probably the best material available on the internet about Miss Finland history, amazing!!! Thank you for your time reading it, Pedro. Indeed, there were some wasted Finnish beauties at Miss Universe.One of my favourite is Anna Liisa Tilus in 1984 who possesses such a very lovely face and nice body during her competition year.I also think Nina Carita Bjornstrom in 1988 and Kirsi Syrjanen in 1992 both deserved to place in their respective years. Finland,in their local pageant,also had its share of upset victories with runners-up way more deserving than the actual winners. Hopefully, I could continue with the next series in 2-3 weeks time, if am not that busy with work and personal stuffs. Last edited by bjoern28 on Mon May 14, 2012 3:42 am, edited 1 time in total. abby_saatchi wrote: Fantastic thread again!!! This is actually my first pageant-related thread in months. The last thread I made was I think about Aung San Suu Kyi last April. Finnish women are busy in other field of endeavours far from pageantry i.e.business and entrepreneurship, politics, engineering, education, IT, medicine, etc. But I still believe that Finland can bounce back. They just need an aggressive organization. Same as Norway. And Sweden is doing well lately.